Remodeling your home is one way to give it a fresh look for fall. One major part of your home to consider renovating is your kitchen. Remodeling your home is one way to give it a fresh look for fall. One major part of your home to consider renovating is your kitchen. Whether you’re looking for a new sink, changing the look of the kitchen cabinets, or you have something else in mind, here are the benefits of remodeling your kitchen this fall. First of all, remodeling your kitchen lets you add more cabinets if you need to. Plus, you can update how the cabinets look, giving them new pieces of hardware that are improvements over the ones you have now. You can also increase the amount of storage by adding a pantry. Knock down the wall between the kitchen and the room next to it, and you can have even more counter space. We’re all concerned about how much energy we use. A kitchen remodeling project can help cut down on the amount of energy you use in the kitchen. Newer appliances will use less energy, as well brand new LED lights that take the place of the fluorescent lights you had before. Sometimes, you need to bring the kitchen out of the past decade. Depending on how long you’ve had your home, you might not have renovated anything since you moved in. 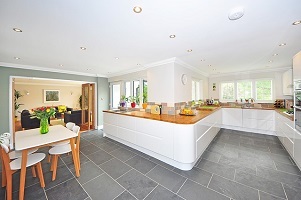 A remodel can give it a new look, complete with new countertops and floors. If your kitchen is too small and too cramped, it can be uncomfortable. This becomes even more of a problem when you’re trying to cook while talking to guests or family members. They might not fit inside the kitchen. Remodeling it can make the kitchen bigger and more comfortable. Plus, by improving the ventilation, you can get rid of the strong smells that can linger after cooking and baking. Think about adding islands so you have another workplace and another place to sit, and add some new garden window to bring more natural light in while improving your view. This entry was posted on Friday, October 12th, 2018 at 3:01 pm. Both comments and pings are currently closed.